After Milsap, What's Next for Portland? After the Utah Jazz officially match the offer on Paul Milsap from the Portland Trail Blazers today, it seems like the team will have to head back to the drawing board. Obviously they made this deal to do one of two things: sign Paul Milsap or force a division rival to have to worry about really shaking things up to stay near the top of the salary cap. Either way, they've made at least one of their goals happen, but what happens in the next couple of months could really make or break this season. I'm not going to start worrying about the extensions of these two players as the organization, Kevin Pritchard, and Paul Allen would be complete morons to not give them whatever they need to be happy here. While this waiting period has been extremely frustrating, I'm going to give the team the benefit of the doubt in hopes that this all works out sooner than later. I'm just hoping that Pritchard isn't putting off their deals while he's out shopping for free agents and trades when he could be using his two stars to leverage these deals. Lamar Odom. 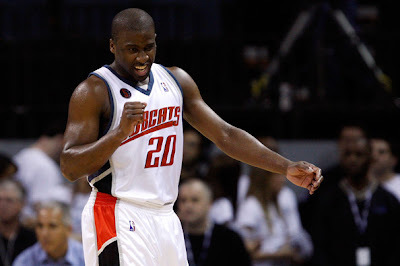 Ray Felton. David Lee. Andre Miller. Ramon Sessions. Do you really want to see any of those guys in a Blazers uniform? Aside from Felton and maybe Sessions, I would have to say "no" to all of them. Odom will forever be a "Laker" to me or just a guy that's potentially cancerous in a locker room. Lee is a starting F/C in this league and asking him to go backup for this team just doesn't seem like a good fit, especially at his price tag. And Miller is just too damn old...oh and he can't shoot for sh*t. Felton would make sense, but at what cost? Just Wait for a Mid-Season Splash? As the economy hovers around "not-so-good" and the trade deadline creeps upon the league, teams are going to look at shedding big contracts. If the Blazers stand still during this free agent signing period, keep the team they have, and continue to improve, a mid-season deal could be just what they need. You talk about bargaining power? Upwards of $8 million dollars would surely give them just that when the winter of 2009 rolls around. explain how odom is bad. other than you just not liking him. fits perfect in to the team. and weakens the lakers. ignore your dislike for a jersey he wore and recognize how great he would be for us. if you like hedo, you should like odom. Lee can't play Center, not even in the East. And Odom is anything but cancerous- he's a pass first player who rebounds and gets along with teammates. And he's a winner. He made the playoffs WITH THE CLIPPERS. Think about that for a sec. I do agree that Sessions is worth chasing. We've got to have more than Blake at PG this year or we're fucked. I like Sessions. But I agree with you on everyone else. Lee is too expensive and too talented to stash on the bench. I like Andre Miller a bit, if only because we don't need a shooter, and some it would be nice to have a true vet. Odom is exactly that to me, a Laker, and personally, I wouldn't want him on the team - I admit it's a personal opinion. But I also don't see where he fits on the team - backing up LaMarcus (would he want to do that?)? Starting at 3 (he'll be burned defensively by other 3s)? Anon - Odom has never been known as a hardworking, "team" oriented guy. He's floated around the league his entire career as an underachiever. Obviously he has talent, but I wouldn't expect him to be happy in a city like Portland. He's publicly said he wants to be by a beach and live that whole "posh" city lifestyle. I just don't want the Blazers to fork out the cash for an unhappy vet. Knee - Agree about Lee...if you can't hack it with the mini-bigs in the east, please don't come out west. And I also agree that Portland needs more than Blake at PG because Bayless is proving once again in Summer League that he isn't ready to be a 1 on this level. Ross - Just don't want the Blazers to go into desperate mode and just sign the guy that the media or Canzano seems to talk about alot (aka Odom). I still say stand with what they've got and make a move before the trade deadline.